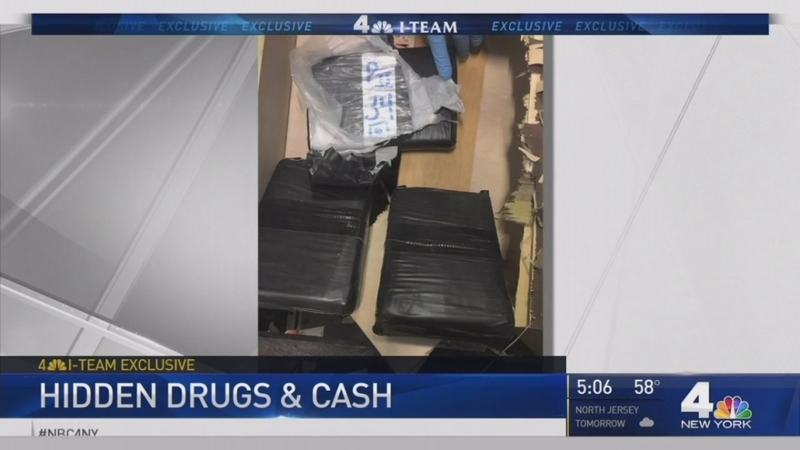 A drug raid in the Bronx initially turned up a lot of wood furniture in a storage facility and nearby U-Haul truck -- but Homeland Security Investigations and Drug Enforcement agents, armed with search warrants, soon found $4.1 million in cash and 3 kilos of heroin, much of it hidden in compartments inside the furniture. Jonathan Dienst reports. A drug raid in the Bronx initially turned up a lot of wood furniture in a storage facility and nearby U-Haul truck -- but Homeland Security Investigations and Drug Enforcement agents, armed with search warrants, soon found $4.1 million in cash and 3 kilos of heroin, much of it hidden in compartments inside the furniture. The heroin was allegedly imported from a Mexico drug organization meant for sale in New York as well as in Lawrence, Massachusetts. Authorities say HSI and DEA agents monitored monthly shipments of “furniture” in and out of a storage facility at 1037 Zerega Ave. In the raid, agents found two end tables that contained much of the cash and drugs. The three kilos of heroin could have been sold in over 900,000 pockets on the street, according to officials. “The potential toll on human lives represented by this amount of drug money, carefully packaged and hidden in hydraulic compartments for interstate traffickers, cannot be measured,” said Special Narcotics Prosecutor Bridget Brennan. Three men were arrested in the raid: Nelson DeJesus, Miguel Angeles and Jorge Pizarro face drug possession charges. The suspects allegedly used bottles of fox urine to try to mask the scent of the drugs. The fox urine was found in a Dodge Caravan belonging to one of the suspects, investigators said. “The organization thought of every detail, from adding a tricycle to their stash of furniture in order to appear like a relocating family, to spraying contents with repellent to ward off police K-9 units,” said New York Drug Enforcement Administration Director James Hunt. Investigators said the three suspects were key players in the ring as they allegedly had direct control of the cash and drugs. Seizing $4 million in cash "hinders the drug traffickers who were supposed to receive it," said New York HSI Director Angel Melendez. The three suspects were arrested over the weekend and have denied wrongdoing. Investigators said they are looking in to who might have helped them in Texas as well as what Mexican cartel is the source of the heroin.